Before going further deep, let us discuss – How heavy an atom is? Well the weight of an atom is mostly because of the protons and neutrons. Electrons are very tiny as compared to protons and neutrons and light as well. Let me tell you that, a proton is approximately 1800 times heavier than an electron and the mass of neutron is almost same as that of a proton. Atomic mass of any atom is the number of protons and neutrons combined. So, more the number of protons and neutrons; more is the mass of an atom and thereby its size. Though, the electrons and protons vary to greater extent in terms of mass and size but, they are equal in terms of charge. Both electrons and protons have charge whereas, neutron in neutral. Protons have a positive charge whereas electrons have equal but opposite charge, i.e., negative charge. This is the reason why an atom is neutral. To make an atom positively charged; we have to take out some electrons from the atom and in order to make it negatively charged; we have to add some electrons to it. So, briefly speaking ; it is the number of electrons , protons and neutrons that creates different elements of nature as we see in a periodic table and these atoms combine together to form molecules and then molecules combine to form much bigger and complex structures and finally such big things that our common sense fails to see the similarities within. Well; what if we go still deeper. Can you imagine what will happen now? OK, let’s move inside a proton. We choose proton as it is bigger than electrons and maybe we could find something more fundamental. 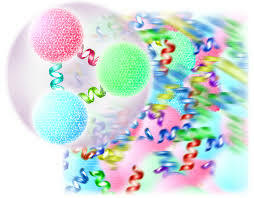 When we see inside a proton we see 3 very small particles interacting with each other and the small particles found here are called as “Quarks” and at this level we don’t find any distinction between a neutron and proton as they are constantly interchanging among themselves. These 3 quarks connected with each other in such a way that it seems someone glued them together. But, this stuff binding the quarks together is called as “Gluons”. This is a very small level to imagine, i.e, less than a quintillionth (10-18 , i.e., eighteen zeros after one) of a meter and at this small scale particle behave so differently and therefore we cannot assume electrons or, quarks as small steel balls for reference. The size of a quark is somewhat larger than electrons but, truly speaking the term “Size” has no meaning at this small scale where the same particle present at different position at the same time and get disappeared all of a sudden to reappear somewhere else. Now, let’s go still deeper. This will be insane but, for science it’s just the beginning of a whole new science. Let us move inside the quark. Inside quark; we find a place called “Quantum foam” and it is not a three dimensional place rather it contains 11 dimension (3 regular + time + 7 extra dimensions). This is place where fabric of the universe found and they are called “Strings”. At this level the distinction between subatomic particles vanishes and what we observe is just “String”. The different vibration of these strings gives rise to different particles like quarks, gluons and electrons etc. Different vibration of guitar strings produces different nodes and same is the case for strings of quantum level. The study of strings of this quantum level is called as “String theory” and still on its developmental stage but, the prediction of this theory is truly remarkable and ground breaking. So this is the whole journey where explored the inside stuff of matters. Hope you have enjoyed the journey. Please do comment how you feel.